You can REGISTER ON-LINE by clicking HERE! REGISTRATION PACKETS ARE AVAILABLE BY CLICKING HERE or stop by your local River Valley District Extension Office! The captain is in charge of organizing the team, making sure that all members are registered and have program information. Captains will receive helpful messages from the local program coordinator at least once each week. In addition to being the "organizer," captains should motivate, connect and celebrate with their team! If you choose to register online for Walk Kansas, the captain is responsible for initiating the process. There will be many opportunities to motivate your team! Think of yourself as a coach, cheerleader or champion. Be positive, encouraging, optimistic and supportive. Believing that you, and others, can accomplish something is half the battle! Create a fun challenge with another team, if friendly competition is motivating. Find activities that team members can do together several times during the program. Get to know your team and learn what motivates them. The first thing you will do is connect with your team to choose a team name and select a challenge (description in right column). 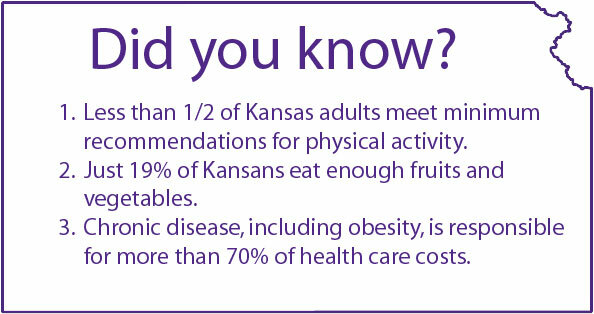 Use the online platform available when you register for Walk Kansas to stay connected, or find other way that works for your team. Team mates do not need to walk or do activities together – they can if they want to. As a captain, it is your role to see that team members interact and connect regularly in some way. Celebration is an important part of a behavior change process. This doesn't have to be elaborate and can be a simple as sending a message each week to highlight success of the team or individual members. Send a motivational text, a cartoon, e-card or postcard. Arrange a fun activity for your team such as a bowling party, miniature golf, a pot-luck dinner or lunch out. Make it healthful and fun! If your local program offers classes or activities, encourage members to participate, and join in for the celebration event if there is one.